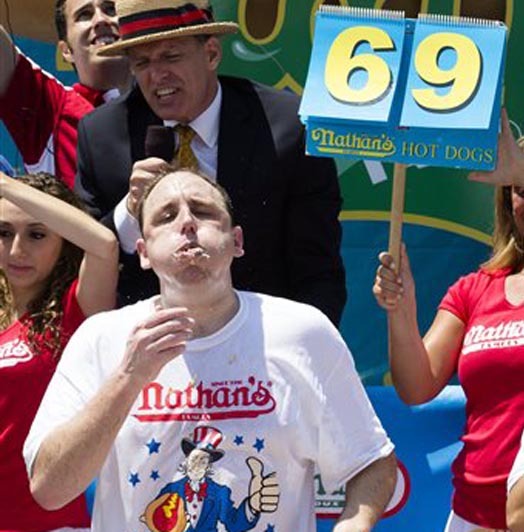 What drives a man to guzzle 69 hotdogs in 10 minutes? At what point in Joey Chestnut’s life did he silently say to himself that he wanted to be known the world over for shoving vast amounts of food down his gullet in short amounts of time? When you think about it Joey Chestnut, who just won his 7th “Nathan’s Famous” hot dog eating contest (and $10,000), is the perfect American paradox. He is an individual who has allowed his heart to take him to great heights, even if those “heights” would be considered embarrassing lows for many others. There are critics of competitive eating who protest that it sets a bad example for the obese population of America. But Joey doesn’t see the connection—any more than he sees one between car-racing events and the oil crisis. 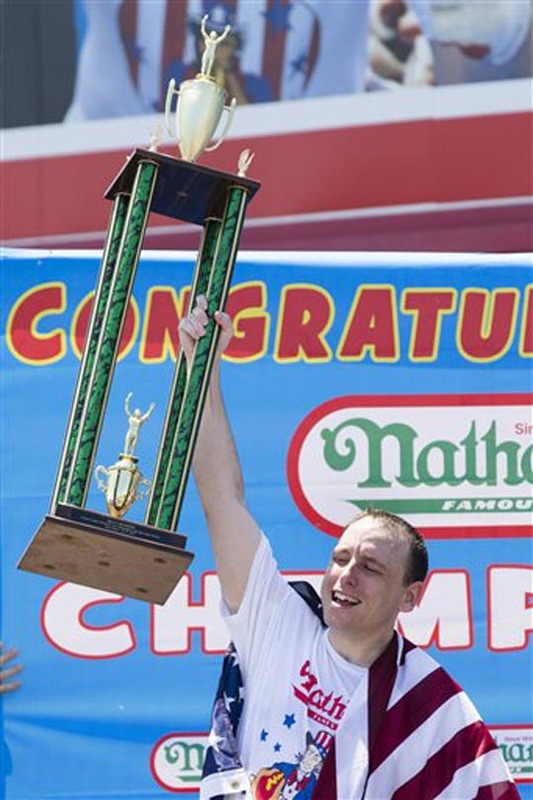 At the end of the day Joey Chestnut seems to be a good person who works hard at whatever he does (construction or competitive eating), doesn’t expect anything from anyone else, and who wants to bring a smile to a few faces each Independence Day. His training regime for the Nathan’s hot-dog contest is a strict one of fasting, running, consuming protein supplements, drinking gallons of water to push his body to the limit, and performing full-scale eating workouts during which he simulates the actual tournament. Joey makes a good point: How is it any more strange for him to be the world’s best “guy who eats tubed meat” than it is to be the best “guy who runs really, really far”? To do what Chestnut does — at the level he does it — takes a kind of discipline that most people today, sadly, do not possess. Indeed, most of the obese Americans out there would not be obese if they honed the kind of disciplinary skills displayed by Mr Chestnut. The cynical part of us always wonders what the world be like if the Joey Chestnuts of the world put more time and energy into curing cancer than chowing down on hot dogs, but a better question might be: “What would the world look like if we were all scientists?” It would probably be a very clean, very healthy and very boring place that would make sane people want to die. Part of what makes life special is all the wonderfully weird stuff that goes on. A man whose root motivation is to push his body to its limits and make a few people laugh along the way is a good man — and a good American — in my book. Sorry, bro. The man’s a total fool. Jim, let’s look at the actual science: The CDC says the average American ages 2 and up consumes 3,400 mg of sodium daily. That’s roughly 1.2 million mg of sodium yearly. So because Joey Chestnut downs a bunch of hotdogs each Independence Day he’ll need kidney dialysis? Wrong. He’ll simply retain water, get thirsty, and drink more water to expel the extra sodium from his body. That aside, Joey Chestnut is a productive member of society. He is a construction manager who seems to have a healthy personal life — who exercises and fasts during the course of the year on top of that. His doctors say he’s perfectly fine. Team Chestnut, all the way. At least he has a job and is a functioning member of society. Plus, Chestnut makes more at his hobby than you do in a year. How do you like them hotdogs? Anyhoo… I really liked the post. Great writing and interesting viewpoint. I feel a little weird saying this but this might be one of my favorite posts on here. I greatly emphasize with Chestnut’s philosophy on life after learning about it in this article. I’d even dare saying he might be a good role model. That, and he’s a better hot dog feaster than me – I couldn’t eat 69 in a day to save my life, let alone in ten minutes. Thanks for the read and the comment, Mark! Yes, he does seem to have a great outlook on life. I’d definitely put him in the role model camp if the Vanity Fair piece is remotely close to being an accurate description of the man. He sounds like a winner to me, let him have his hot dog and prize money.